Why is My Rat Trap Not Working? Rats are never welcome in the home, but unfortunately, they have no problem sneaking in with ease. When rat infestation occurs, there are many problems associated with their presence in your home, from damages to your property, to the spreading of certain illnesses. A great way to combat rats in your home is through the use of traps. However, there are many ways that traps can fail you when used incorrectly, so keep an eye out for these potential problems when using them. Poor Placement – Rats like enclosed spaces and will rarely venture out in the open if they don’t have good reason to. If you have placed your trap in the middle of the room, it is highly unlikely that it will catch anything. Setting the Trap too Soon – Rats are very aware of their surroundings and will not investigate new additions without proper acclimation. Bait your trap, but do not set it for a few days. This will make them trust the trap and be more inclined to approach it again later when you actually set it. 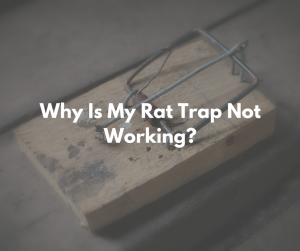 Wrong Trap – Because of their similar looks people often confuse mouse traps for rat traps. While they serve the same function, a mouse trap simply is not large enough to adequately trap a rat. Rat traps are significantly larger and therefore strong enough to get the job done. Not Enough Traps – Once the traps start working the rats will catch on. Statistically, the most rats are caught on the first day, so it is best to set many traps over a short amount of time for the greatest yield. Do-it-yourself traps are great, but they are no substitute for help from the professionals at Critter Control of Fort Worth. You should not have to deal with unwanted rats in your home, so allow our technicians to come and assess the situation and provide you with the best removal techniques. If you are facing rats in your home, contact us today at 469-805-6267 for your free consultation today.